The long-awaited opening of French Press Coffee & Specialty Drinks in Plainville took place on Tuesday, January 30. 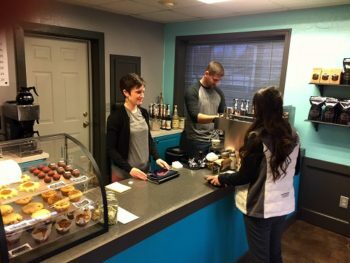 Owners Adam & Dayna Kocinski expanded their successful operation in neighboring Natoma to include the Plainville location. One motivating factor for the new location is the increased traffic along Highway 183. The new store is located at the NW corner of the intersection of U.S. Highway 183 and Kansas Highway 18. French Press offers a variety of Espresso, Hot Chocolate, Hot Tea, Milkshakes, Apple Cider, Smoothies, and more. In addition, there is always a selection of pastries to go along with the morning coffee. For now, customers will need to enter the store, even though a drive-up window is in the future plans. Hours of operation are Monday through Friday from 7 a.m. to 5 p.m., and Saturday from 8 a.m. to 4 p.m. Closed on Sunday.